We encourage an approach to self defence which takes account of the physiological, psychological and legal aspects of managing violence. The ‘universal human phobia of interpersonal conflict’ effects every person in similar ways, and this realisation is at the core of our training philosophy. Since 2006 Dynamis has been working to create safer environments at schools, working with both students and teachers. In these self-defence courses, we bring our experience to bear to talk about the 9 attitudes for Personal Safety. Therefore, our workshops deliver thought-provoking ideas which are focussed on enabling the participants to have confidence in the personal safety decisions they make when they leave our session. We are future-focussed. When should I listen to my inner guardian: Intuition? How do increase my awareness of warning signs in interactions with others? How can I broadcast and use strategic body-language to improve my safety? What talking strategies can I use to stop from being targeted for an assault? How do the Bad Guys choose who, when, where? What Mental and Emotional Strategies do Survivors use to persevere? The positive outcomes of our previous sessions have included: greater confidence and self-worth; feeling of control over physical space and boundaries and environment; understanding about natural reactions. These ideas are based on researched behavioural approach to interpersonal conflict, described in our community as the “universal human phobia”. We start from a position that every person responds to violence with a phobic-level aversion. Our goal is to lay out and clarify the issues involved so that we can, together with your group understand them and create actionable knowledge. Activated when there is nothing to worry about, when in a place or among people who make you feel safe and secure. An important anchor for all that is good and worth protecting in life. Activated when our innate body-mind system detects some anomaly in our environment which draws our attention and demands that we examine it closely to review if we are safe. Activated when we identify that an anomaly in our environment is a risk to our safety and we actively need to do something to reduce the threat of it becoming harmful to us. Activated when our instinctive protective mechanisms have fired under a sudden assault and and we cognitively seek to leverage those reflexes to survive the inital collision. Activated at the moment when, fuelled by emotion, we physically, psychologically and emotionally regain balance and transition into productive movement to stop or slow the assailant. Activated when we press an opportunity created by survival and reversal and exploit it by causing dysfunction in the assailant, in order to meet our protection goal. Activated when our protection goal is to move towards safety and away from the assailant immediately as the opportunity presents itself. Activated when we cannot simply move towards safety and away from the assailant, usually in complex situations regarding some duty of care to them or others. Activated when the only viable option to create safety is to definitively stop the assailant from being able to continue to cause harm. Our team has been delivering personal safety and self-defence training for over ten years. We can deliver a meaningful and memorable experience to your group in any timeframe you can allocate to us. Our message, regardless of timeframe is of Prevention, Reversal and appropriate Resolution of any confrontation. A 1-hour or 90-minute session on how to think about inter-personal confrontations and the importance of successful resolutions for a happy life. A Half-Day course covering the fundamentals of the 9 Attitudes for Personal Safety, both conceptually and physically. It is totally up to you what duration of engagement you would like our team to have with your group and we can expand or contract our set of learning outcomes appropriately to your resources and timeframe. Use the Contact Box on the right hand side to get in touch! “Since 1986, I have studied all around the world, exploring systems and meeting instructors from a variety of traditions and methodologies. I studied Japanese at university, studied the old texts, lived in the culture. My goal was then and still is now, to be able to answer the difficult questions about interpersonal conflict in the most meaningful, helpful way possible for my students. I have learned, and earned, my craft from some of the pre-eminent thinkers and coaches in the world, and retain close ties to those who continue to inspire me. In my corporate work, I primarily meet human services health and care staff, teachers, nurses, community workers of all kinds, contact professionals from the security, financial services and property sectors and from time to time I work with survivors of sexual assault or bullying. 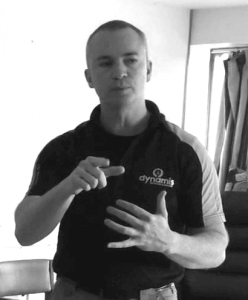 Dynamis Gym is the vital testing ground I established in 2006 where people with varying experiences with conflict come together to explore the reality of violence, aggression and the means to stop it or prevent it. The environment is inherently a safe one where health, wellbeing (and injury prevention) are valued. I often have only limited time with my students, but I am always inspired when the attitudes and methodology we use as trainers bring clarity to the problems of confrontation our people face in their life and work. Where we have more time with individuals on a private basis, I have seen them transformed by our physical and tactical training – they emerge more confident, more aware, with fewer limiting beliefs. Please visit this page to see a full outline of professional qualifications for Gerard O’Dea.